Sometimes we get so interested in earlier history of our families that we forget to record our present-day history. 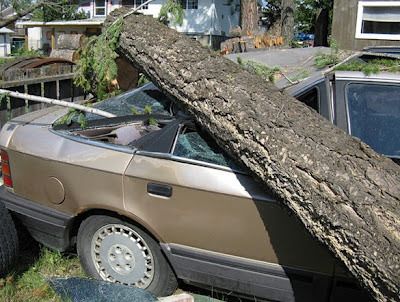 In July, Cranbrook, British Columbia was hit by a violent wind storm that ripped large trees from the ground and left people without electrical power for 8 days. My brother's property looked almost like a war zone. This was sent to me by my brother Lloyd. "Here are Pictures of the Wind Storm that went through Cranbrook B.C. on Friday July 20th. It took two days to clean up the mess. The Pictures are of Reg Buchanan’s Place." http://www.flickr.com/photos/36430631@N04/ As you can see from the photo above, German metal was no match for BC Fir. Meal, Flour, &c., for Sale, on moderate terms. We don't know when the Buchanan family first boarded ship, but we have a better time line later, so I will work backwards in time. Prior to this they spent a month in quarantine in Kingston: maybe September or October. They spent 9 weeks crossing the Atlantic: maybe leaving Ireland in June or July and arriving in Canada about August or September 1847. The quarantine station at Quebec had overflowed, so passengers were being sent on to Kingston, Ontario. The ship was refitted, I have seen no time period listed but I am guessing two weeks, in late May or early June. They were out from port 10 days when the ship was damaged in a storm and returned to harbor (same harbor?) for refitting. If it took 10 days to get to the point where they turned around, it maybe took 10 days to return (they would have the wind in their favor now). From this I would estimate their original departure to be around the beginning of May, 1847. So there is an excellent chance that they saw the Superior prior to their second departure for Quebec, since Derry was the closest port to Drumquin. They lived on the rural townland of Binnawooda, near the village of Drumquin, County Tyrone, Ireland.